Formerly allied in desire to oust the president, Ukrainian politicians are increasingly at odds with each other as they keep an eye on highest office in the troubled country. 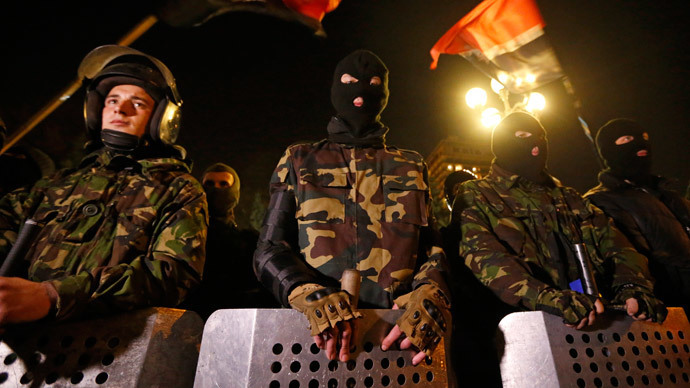 But no one has the popular support needed to unite Ukraine. The collective of contenders for the presidential regalia in Ukraine’s election on May 25 is vast and varied. 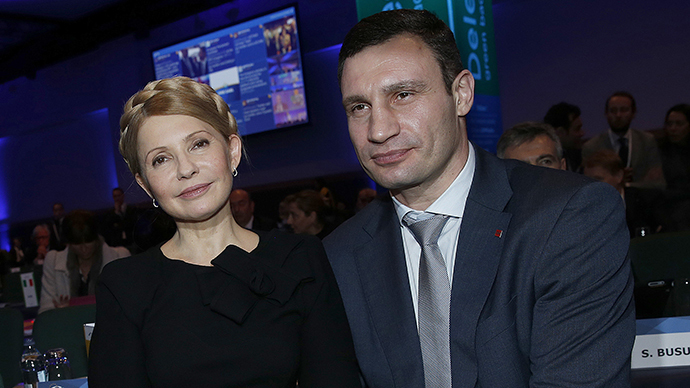 They range from the one of three formal leaders of the Maidan protest, Vitaly Kiltschko, to ex-PM and recently-released prisoner Yulia Tymoshenko, to radical nationalist leader Dmitry Yarosh. The presidential campaign appears to be dissolving the shaky alliance which brought the opposition to power in Kiev, reports RT’s Aleksey Yaroshevsky. Klitschko this week blasted the government, which is dominated by PM Arseny Yatsenyuk’s Batkivshchina (Fatherland) Party, for inefficiency and said his Strike Party may seek the dismissal of acting President Aleksandr Turchinov, also a member of Batkivshchina. 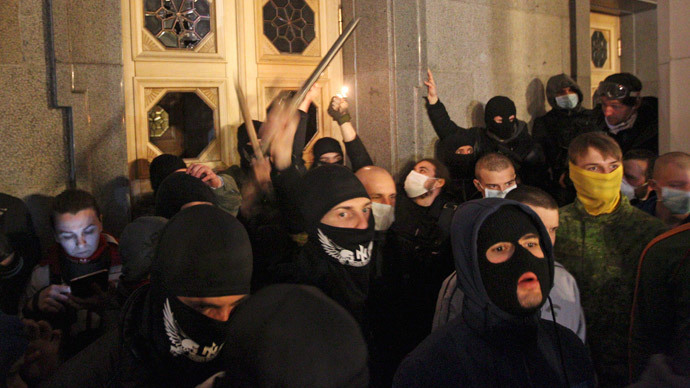 Further evidence of an impending rift came last week, when Ukraine’s National Security Council announced that Kiev will impose a visa regime with Russia. 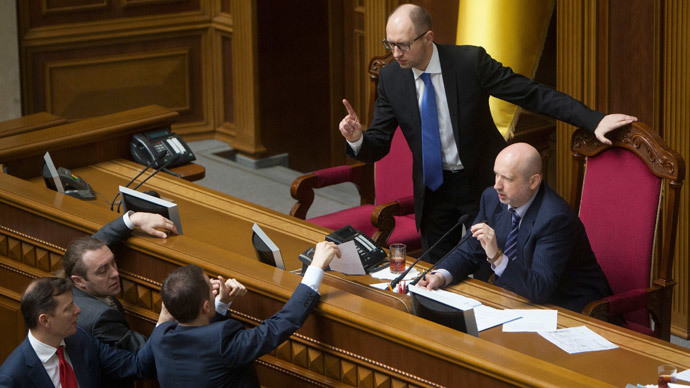 However, just hours later Yatsenyuk disavowed the statement, saying that he’d had to leave a council meeting early and the decision had been taken without him. Meanwhile, the Ukrainian populace seems to be more-or-less disappointed in what the current political spectrum has to offer them. A mid-March opinion poll showed that among potential presidential candidates the one with the highest approval rating has the support of just over one third of Ukrainians. Pyotr Poroshenko, a confectionery magnate, would score 36.2 percent of votes, according to the poll, and that rating is rising. Interestingly, Poroshenko currently holds no public office and can distance himself from whatever unpopular decisions the authorities take. He also hasn’t completed the paperwork needed to be registered as a presidential candidate. Klitschko has a 12.9 percent approval rating, which is comparable with that of late-February. He’s neck-and-neck with Tymoshenko, who has 12.0 percent. The candidate from the disgraced Party of Regions Sergey Tigipko scored 10 percent, while all other runners staying behind. The campaign comes amid a looming default and new austerity measures the government takes to secure IMF loans. The candidates have to appeal to a polarized society, where many people no longer trust any politicians to represent their interests. As the election draws near, the temptation for candidates to start the usual mudslinging and blame competitors for any ills in the country grows stronger.